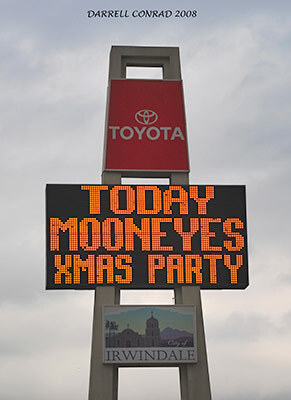 On December 13th, Chico Kodama and Shige Suganuma, owners of the Mooneyes stores here and in Japan, hosted a Christmas Party at Irwindale Raceway. 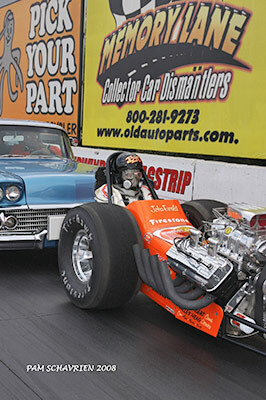 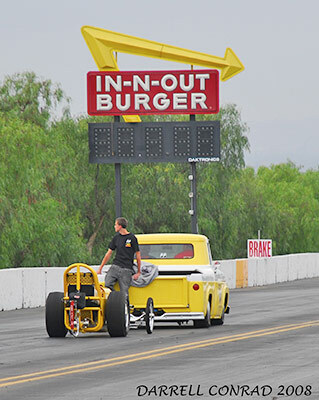 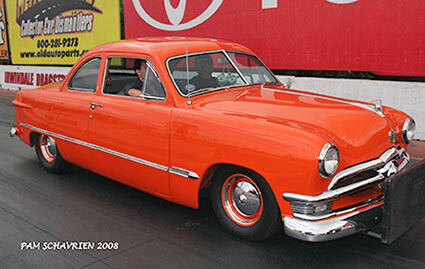 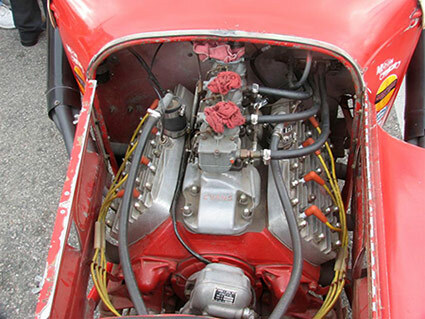 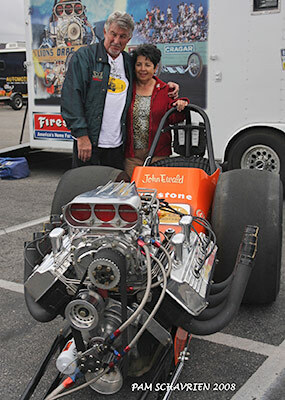 The event included drag racing, live music, cacklecars and a hot rod/custom car show. 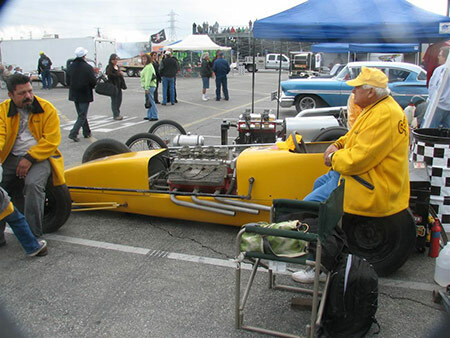 Many of the attendees arrived Friday afternoon to set up and that was a good plan, because by 7:00 A. M. on Saturday there were already 3,000 cars in the grounds. 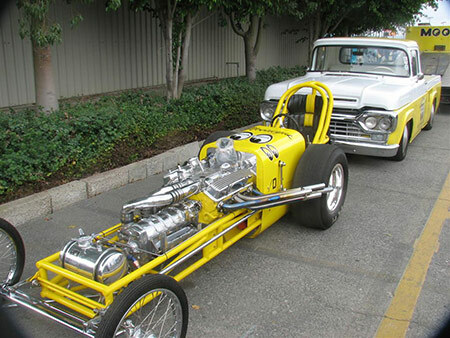 About half of them were car show participants and the rest were spectator cars in the parking lot. 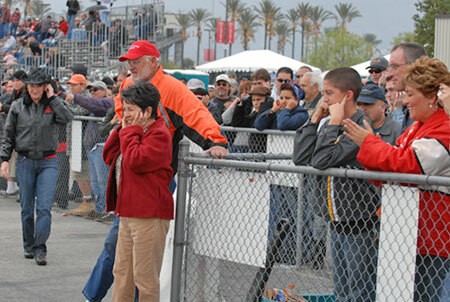 By 8:30 no more entrants were being accepted for the days Cacklefest activities. 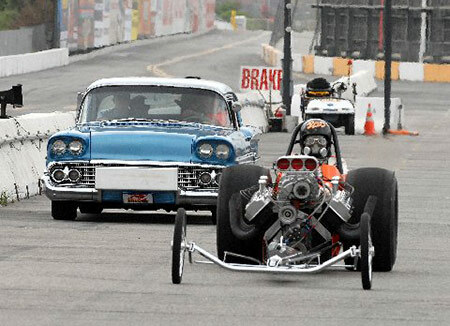 By 11:00 it took over 45 minutes to get through the gates and get parked. 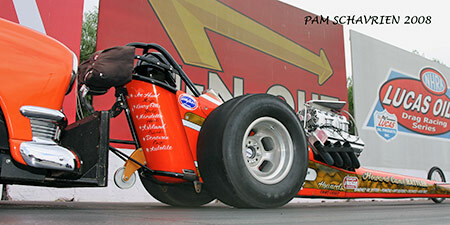 Photos by Darrell Conrad, Pam Schavrien, Rod McCarrell, John Ewald and James Drew. 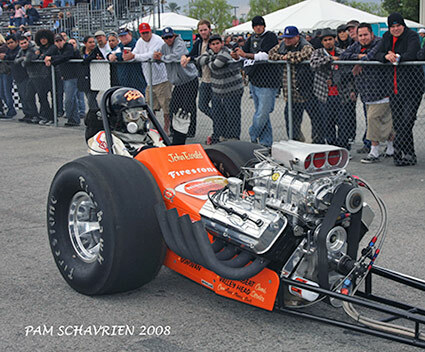 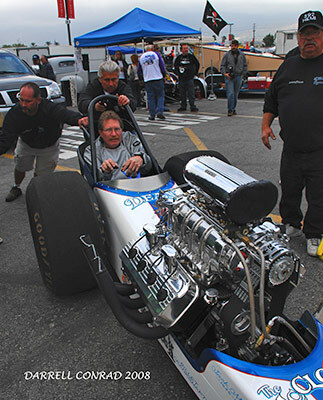 The Estrus Racing Nitro Funny Car of Richard Stannard. 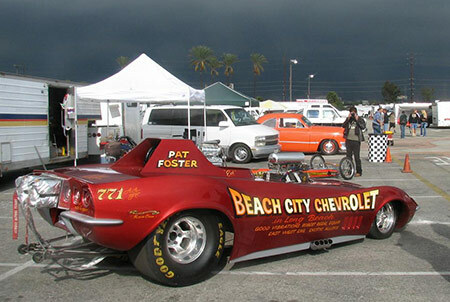 A great reproduction of the Beach City Corvette driven by the late Pat Foster. 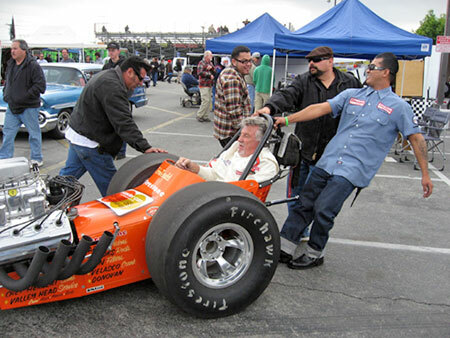 A handful of the original members of the Bean Bandits from San Diego brought this car. 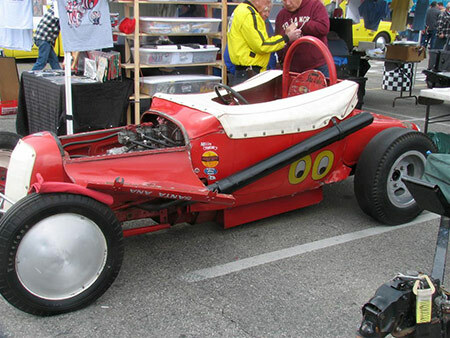 This track roadster belonged to Creighton Hunter, one of the originators of the drags at Santa Ana. 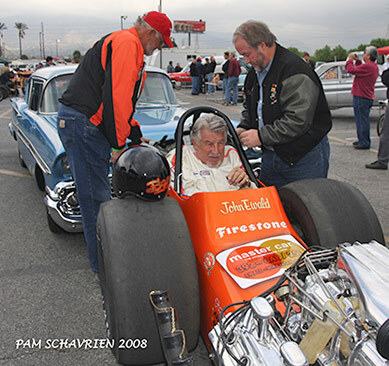 One of Creighton's buddies painted the eyeballs in the car's 00 number, Dean Moon saw it and asked if he could use it as his logo...and the Mooneyes history began. 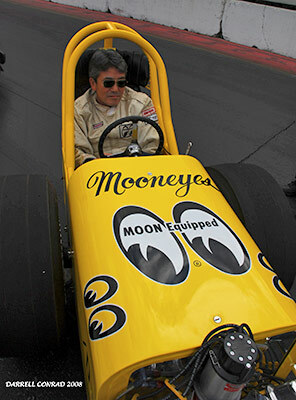 The Mooneyes car, which last appeared at the Goodwood "Festival of Speed" in England in June. 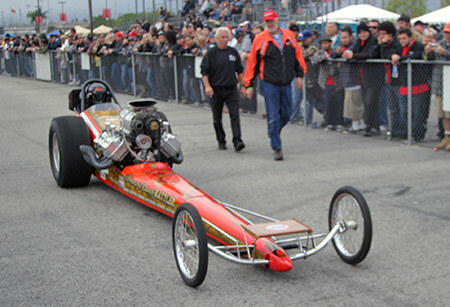 The day started off with the cacklecars warming up. 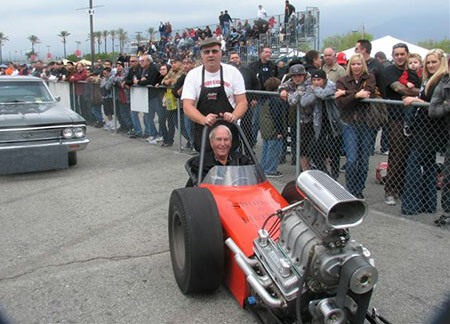 Ron Johnson brought his Shubert & Herbert with the express intention of doing his first push start. 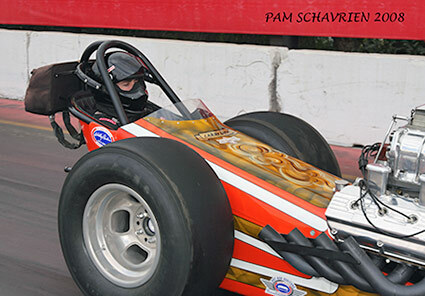 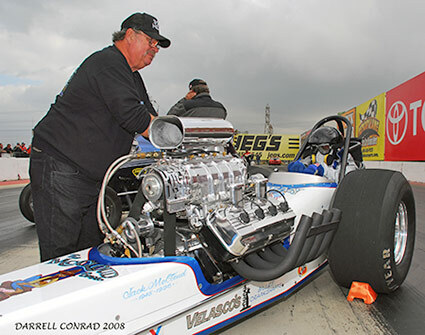 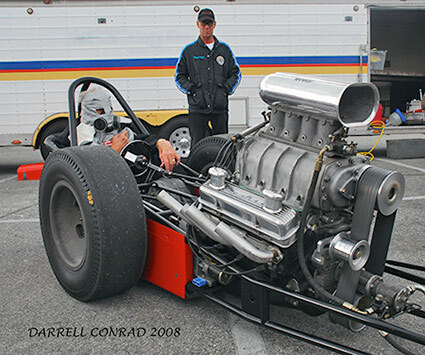 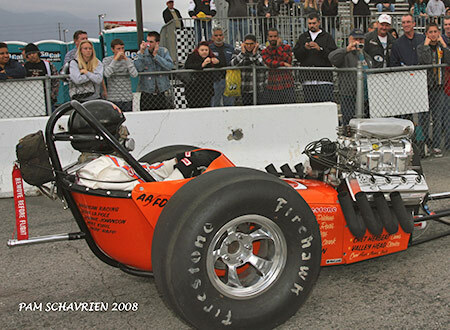 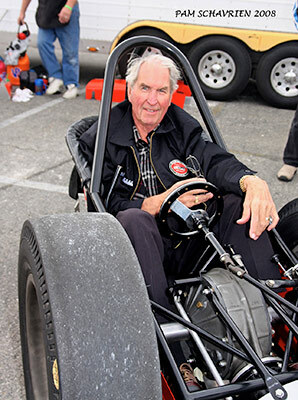 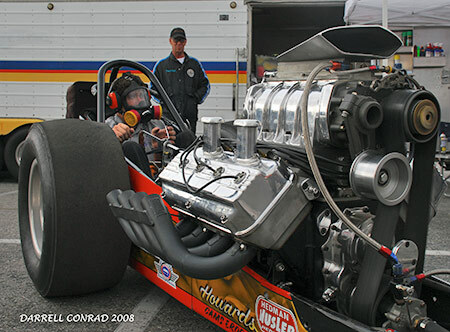 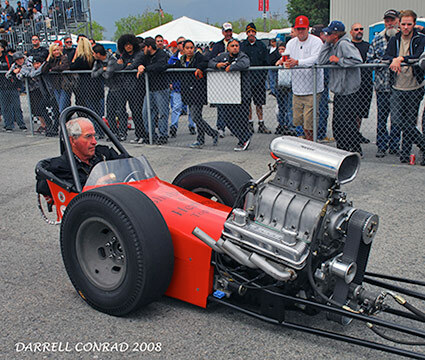 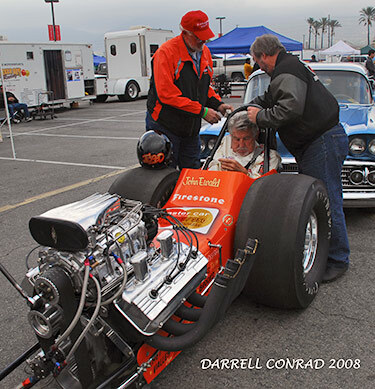 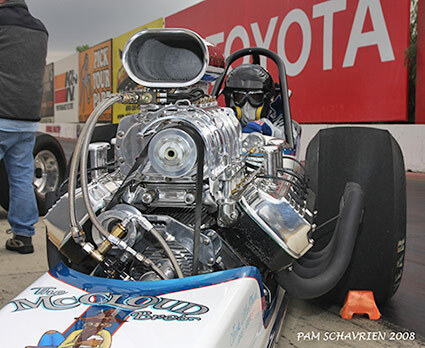 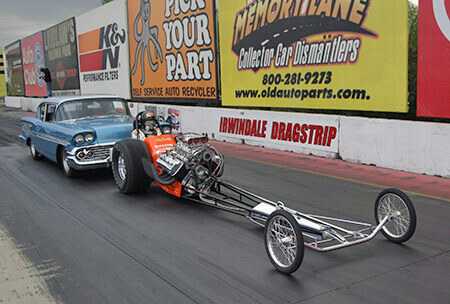 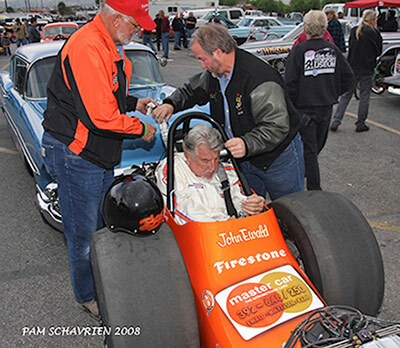 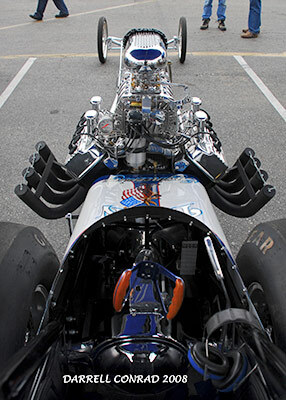 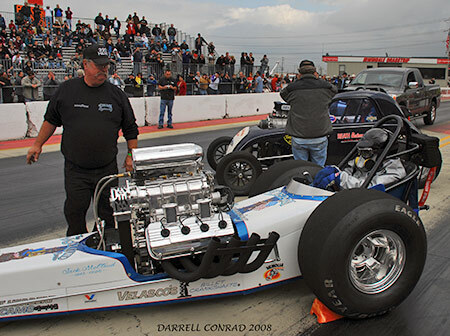 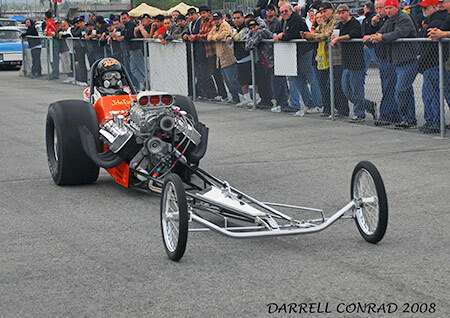 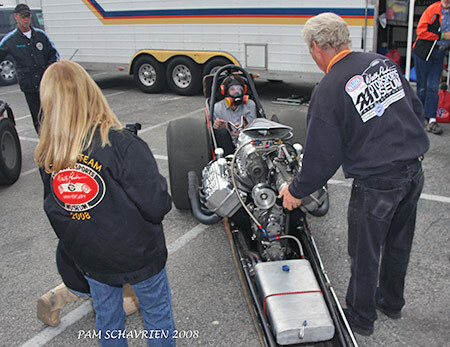 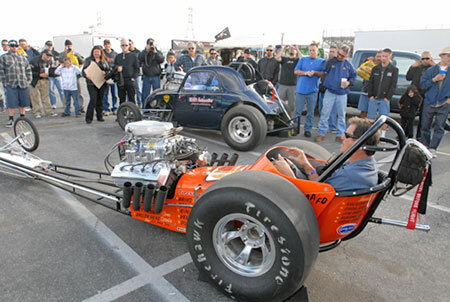 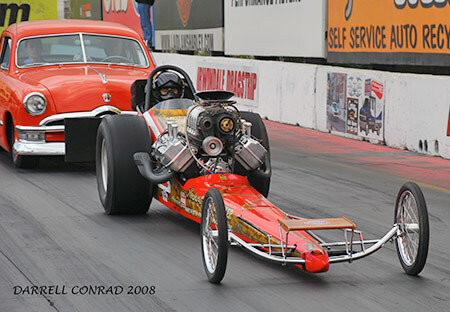 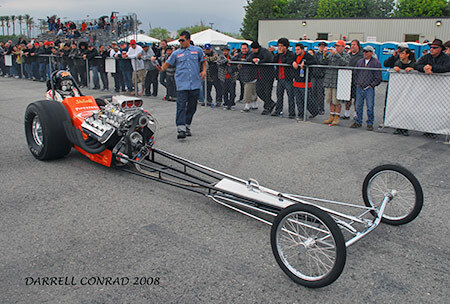 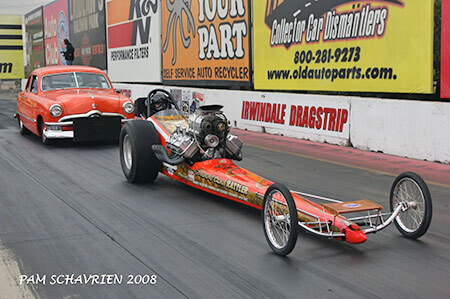 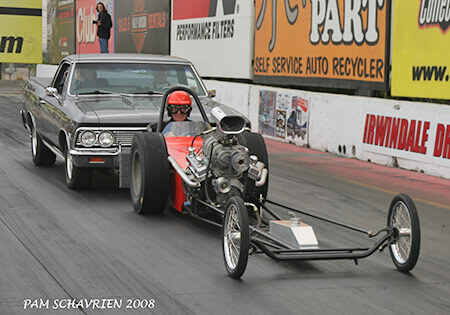 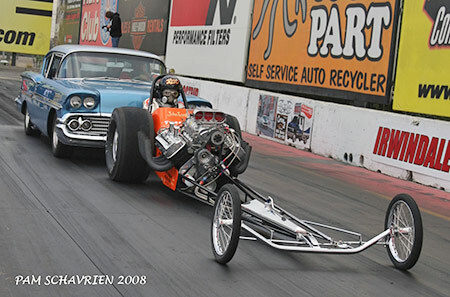 John Ewald had offered Steve Gibbs, retired NHRA Competition Director and NHRA Museum Director, an opportunity to experience a Cacklefest push start some time ago but could never get the right time and place. 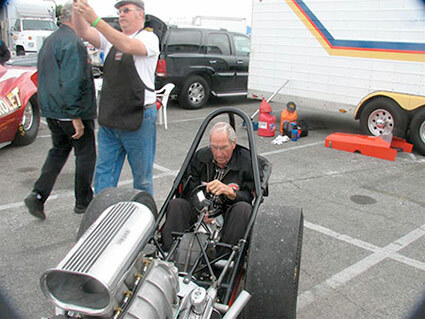 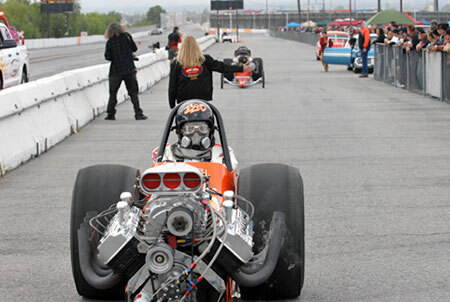 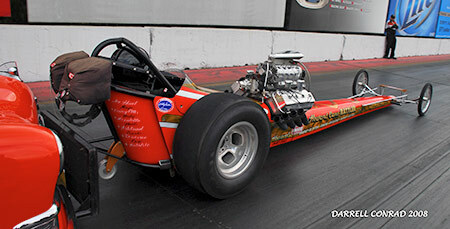 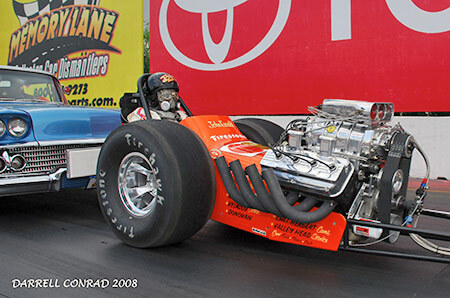 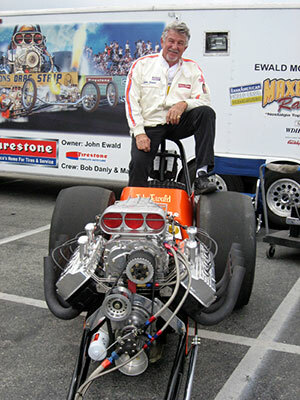 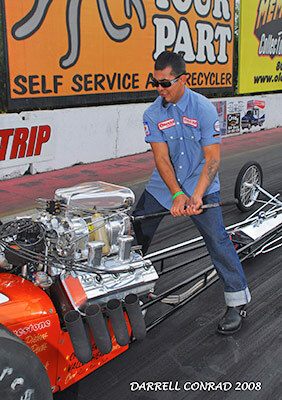 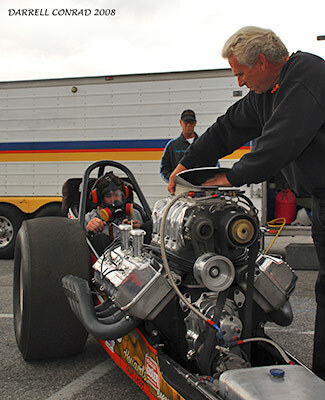 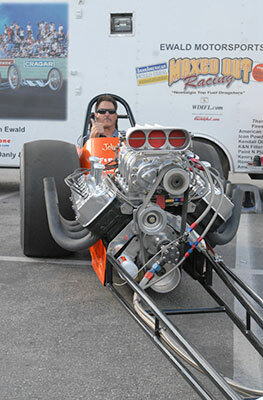 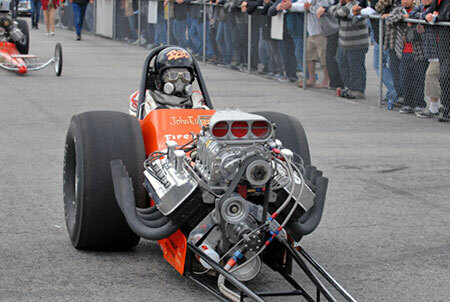 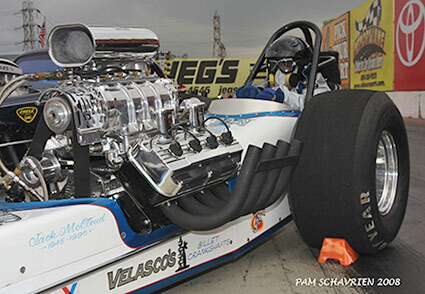 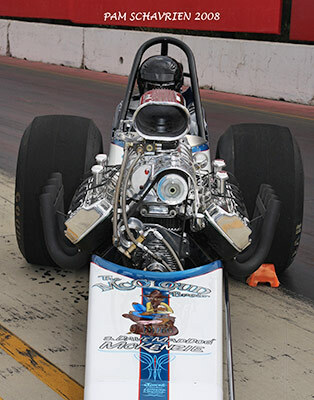 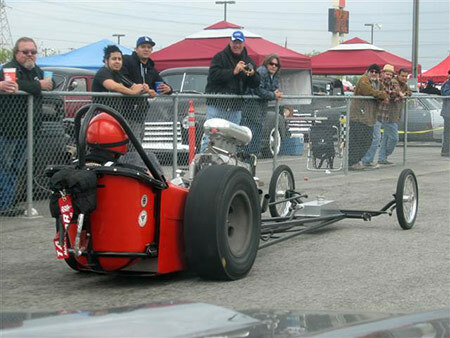 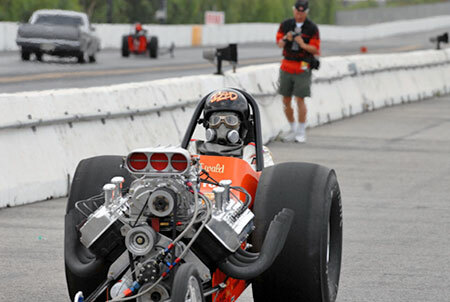 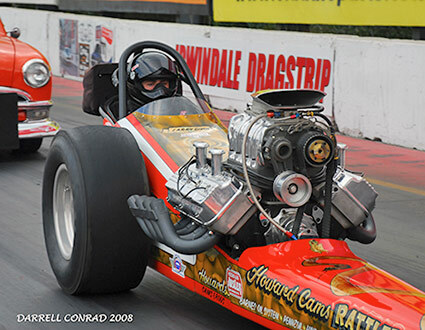 Gibbs, who has been involved with drag racing his entire adult life had never been in the seat of a Top Fuel dragster. 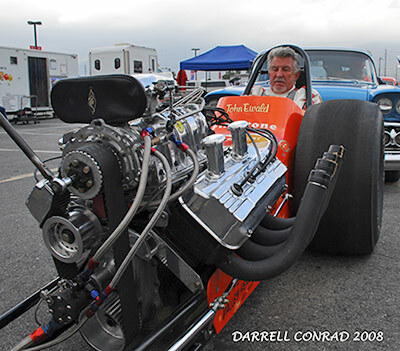 He has organized and overseen every Cacklefest since its conception - always on the outside looking in. 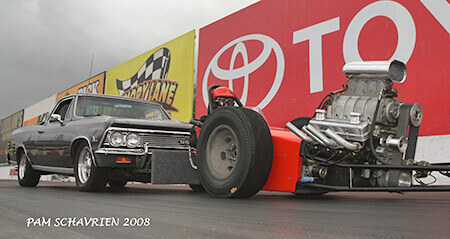 This was the time and place for Gibbs to "get his license" and feel what he's been missing all these years. 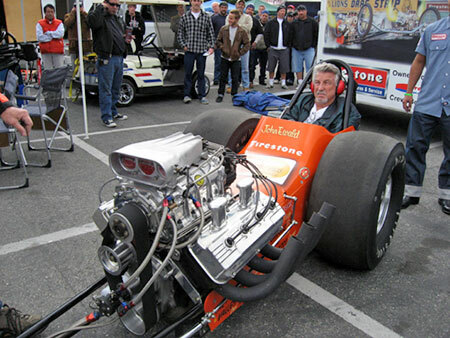 He started out with a morning warm up. 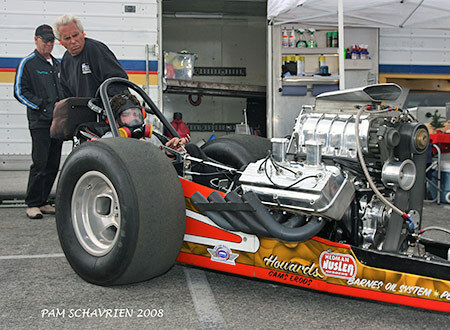 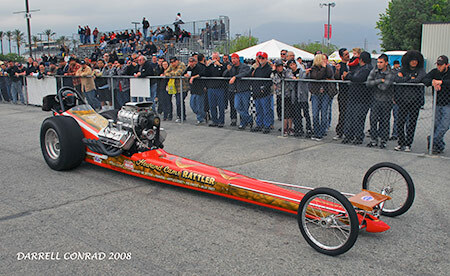 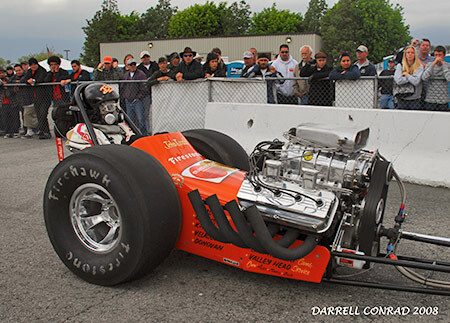 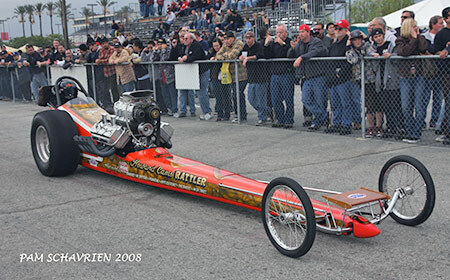 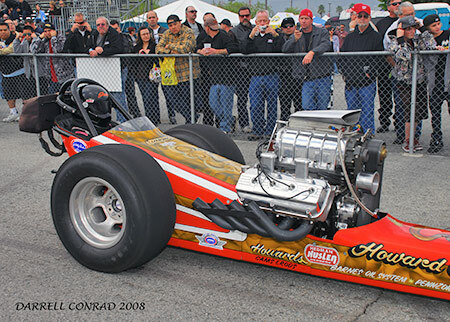 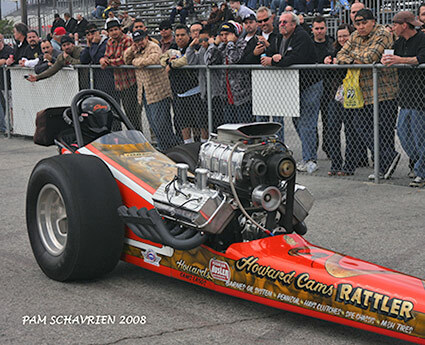 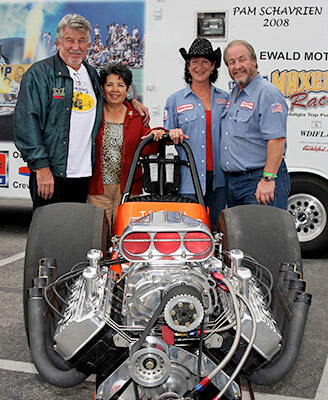 Dusty and Gwen McWilliams were on hand with the NHRA Museum based Howard Cams Rattler. 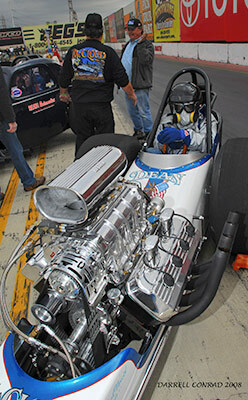 Dusty McWilliams' son Shane McWilliams (college student) was in the seat. 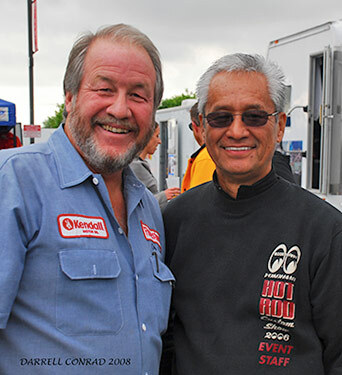 John Ewald and Chico Kodama, between the two of them quite a show was put on for the thousands in attendance. 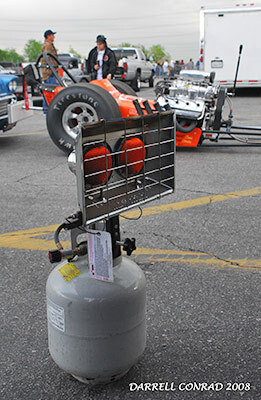 Rare site in California - a pit heater. 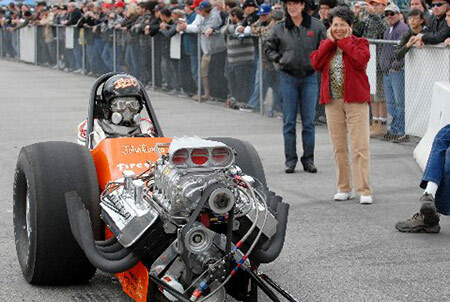 When it drops below 70 here the locals panic. 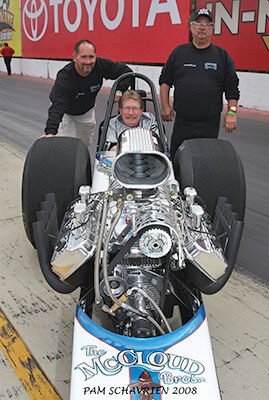 The McCloud brothers were in attendance with their Dean Engineering Spec. 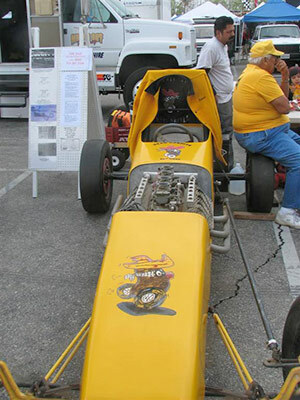 The Cackle Car portion of the event was separated into two parts. 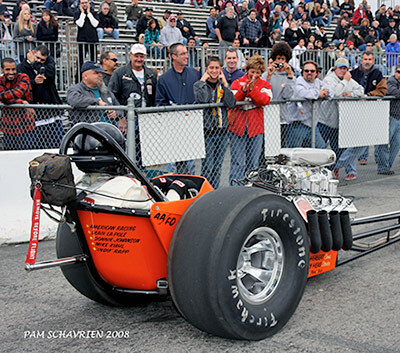 The push start cars were started by pushing down the track and making the turn onto the return road and pulled up in front of the grandstands. 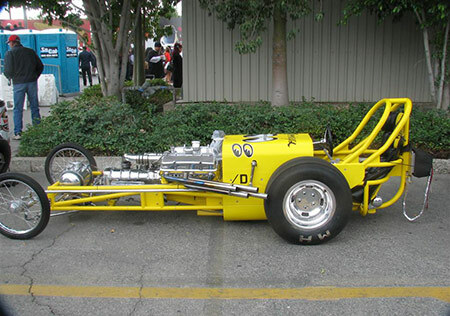 There were three of these. 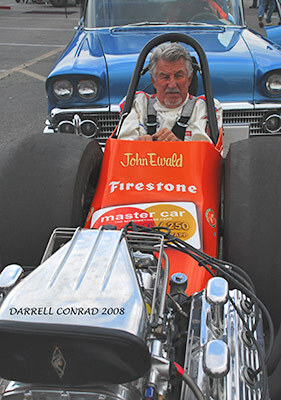 John Ewald's "Mastercar", the NHRA Museums' Howard Cam Rattler and Ron Johnson with his Shubert/Herbert car. 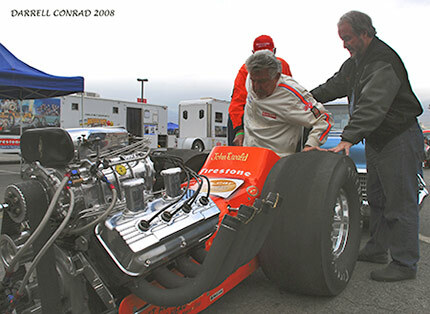 Steve getting into the proper attire for his upcoming adventure, assisted by Bob Danly. 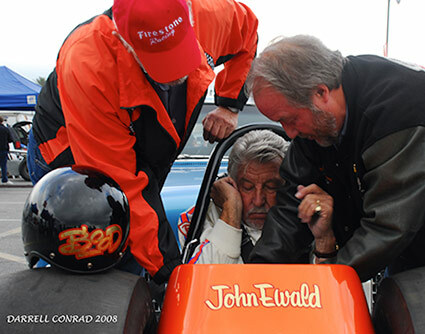 Danly and John Ewald prepare to buckle Steve into the car, prior to taking to the track. 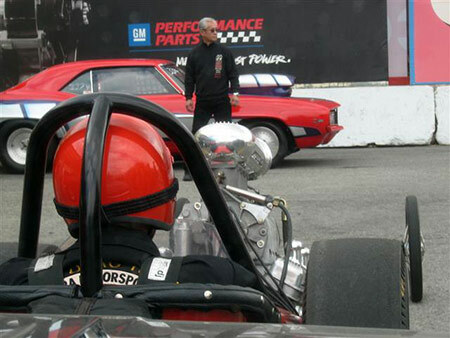 Although Gibbs wasn't going to make a pass, just a push start he was strapped in tight and wore all the proper gear as if he was going to run. 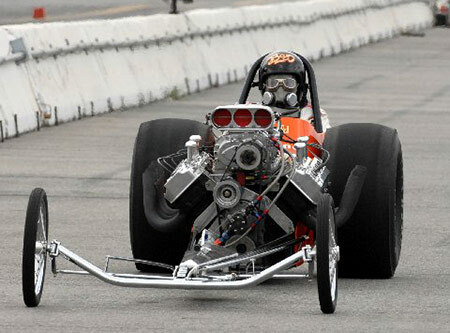 This is done in the interest of safety by all cackle cars when being push started...these cars will idle at 90 MPH! 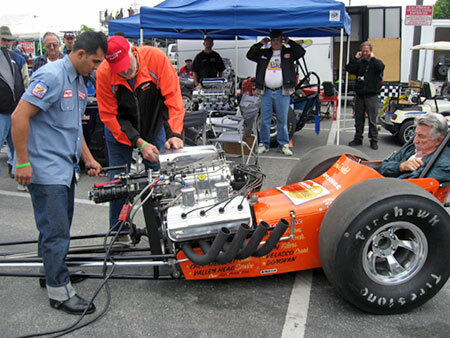 Mario Garcia gives the engine the customary "back-off" (making sure there is no raw fuel in the cylinders) prior to the push start. 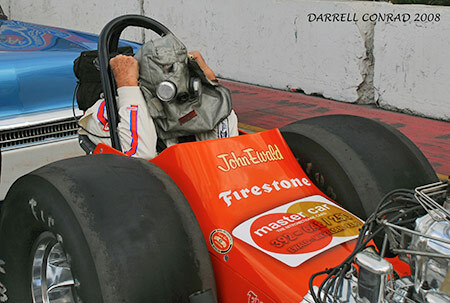 John Ewald gives Steve one last check and puts on his goggles..."the man" is ready to go. 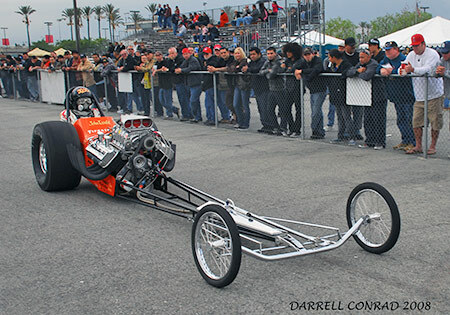 With Danly in driving the push car the show began. 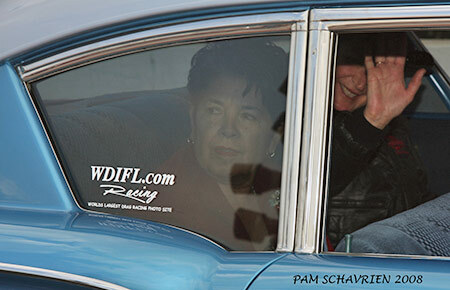 Gloria Gibbs (Steve's wife) and Cynthia Carpenter got the back seat. 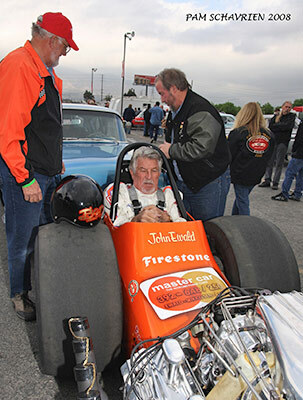 Steve did a picture perfect push start, made the turn and idled back toward the starting line on the return road. 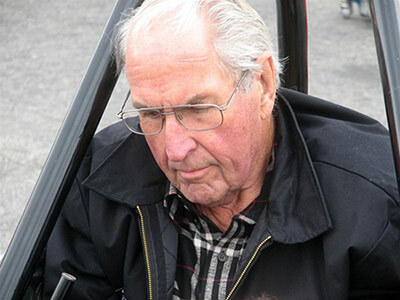 Steve was heard saying after his cackle "good thing I didn't do this 35-40 years ago...my whole life in racing would have taken a different direction". 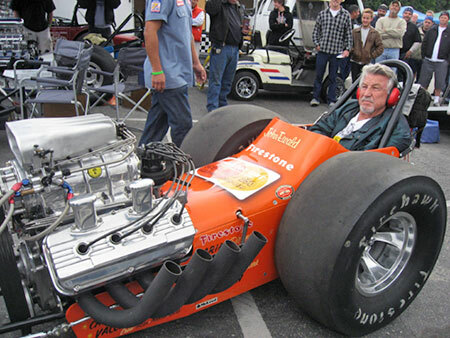 Of course he would have had a car that "fits" him built! 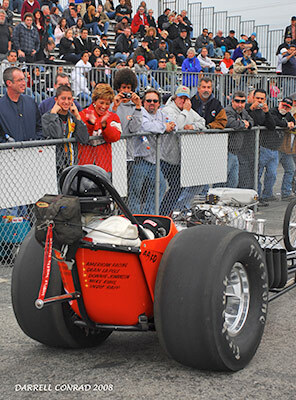 It didn't take long for Steve to get into the "driver" mode...he gives his family and fans the customary wave...It's hard to enjoyed the view from the drivers seat as you go by the crowd. 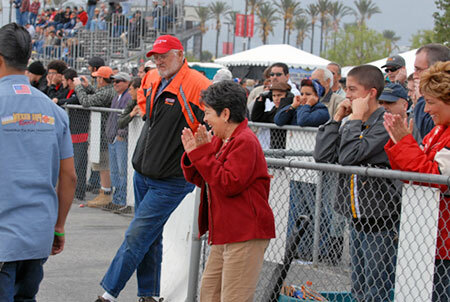 Cindy Gibbs Arias, Steve's daughter and her sons Justin and Steven are standing just behind the fence. 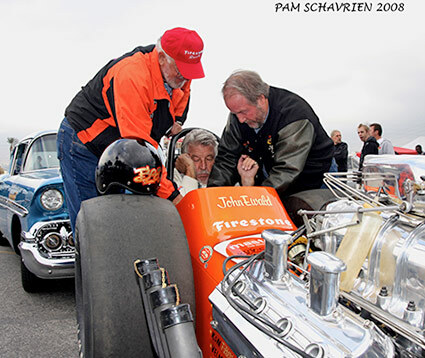 Cindy in the orange and white jacket. 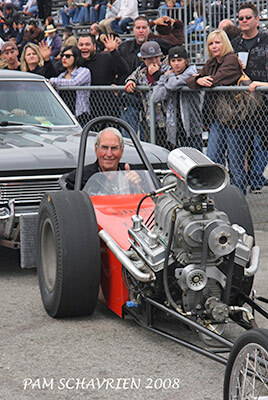 Grins all around! 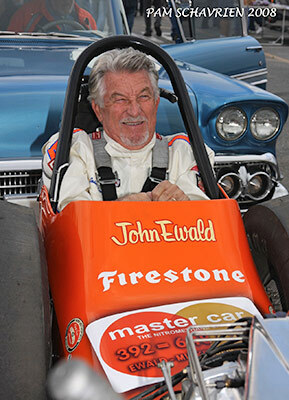 Gloria "Gordy" Gibbs standing behind the car, now in full enjoyment mode... having almost as much fun as Steve. 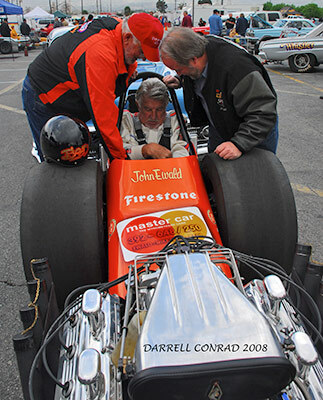 Steve, John and Gordy...an extremely fun day for all. 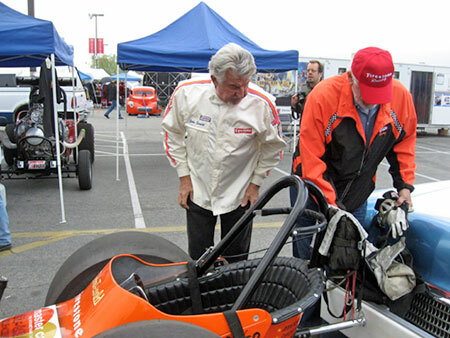 Mario and his pals get the honor of backing Steve back into the pit space...something Steve has done thousands of times for other drivers over his history in the sport. 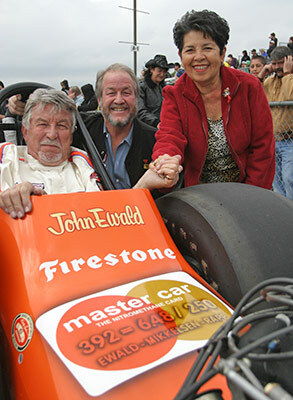 Steve and Gloria with Cynthia and John. 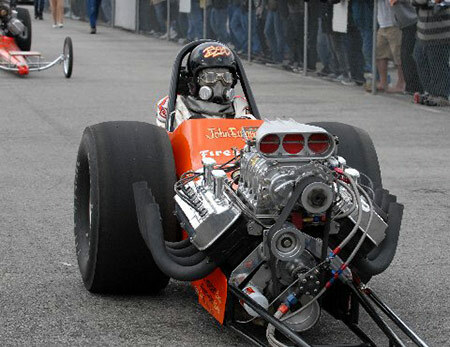 All's well that ends well. 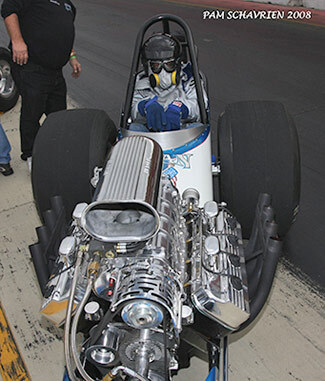 Following Gibbs down the track was Shane McWilliams in the Howard Cam Rattler...he has done a push a few times before and father Dusty wanted him to have some more "seat time". 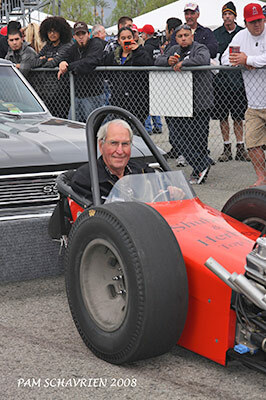 Last up for the push started cars doing his first push start ever was Ron Johnson in the Shubert-Herbert car...at the finish you had no chance of wipping off the grin on his face! 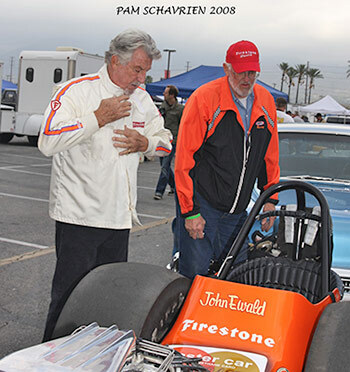 Son Kol stands with the still grinning dad, Ron Johnson...probably won't see as many other drivers in this car in the future...Ron's got the bug! 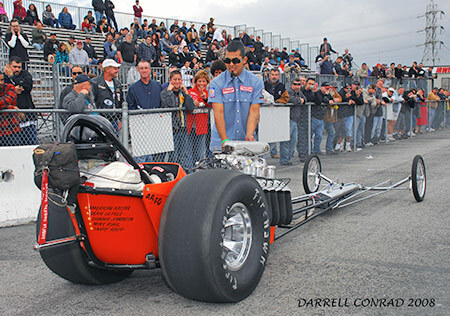 Jake McCloud led off the static started cacklefest with longtime friend Marshall Westmark in the seat...the healthy sounding Hemi was music to the fans ears. 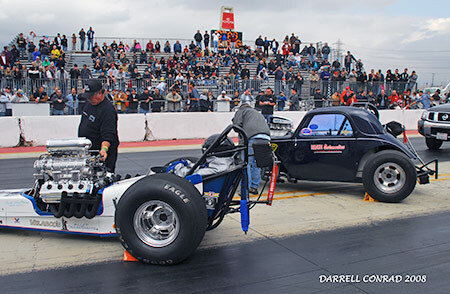 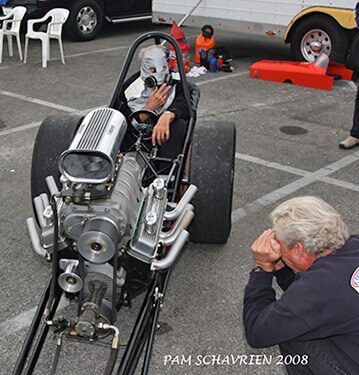 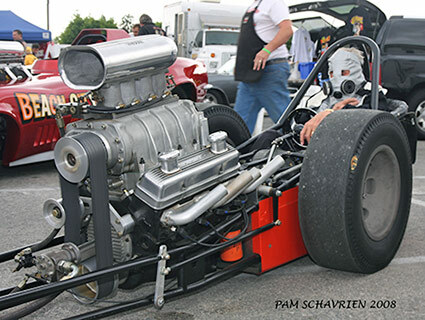 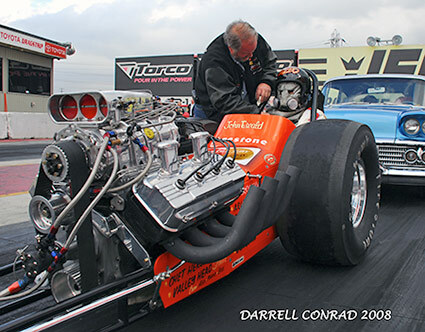 Jake keeps and eye on his Hemi as Ron Stearns makes some noise with his Chevy powered altered in the background. 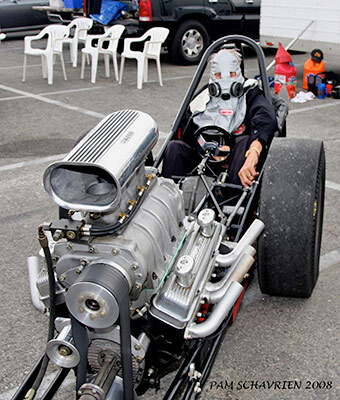 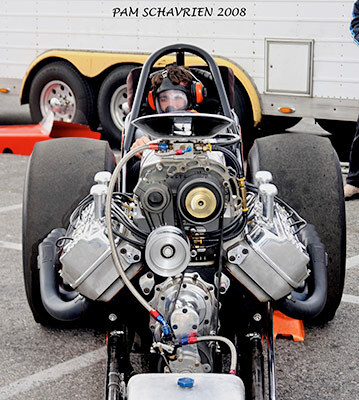 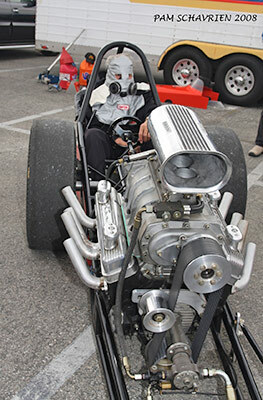 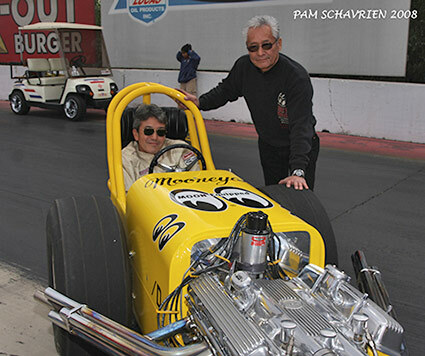 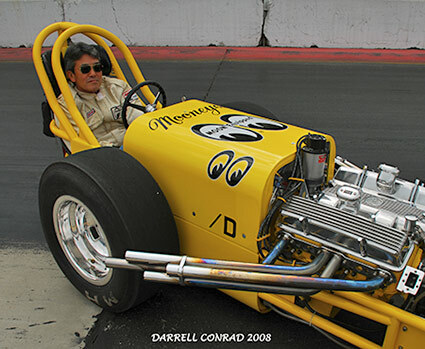 "Shige Suganuma, Chico's brother, enjoys the opportunity to sit in the seat of the running Mooneyes Dragster. 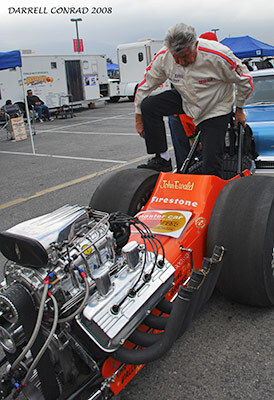 Shige is based in Japan and manages the Mooneyes business there."